Shearer Crewe Sweater- Mens is rated 4.7 out of 5 by 3. Rated 4 out of 5 by slyfink from great casual sweater. not a crossover piece I like this sweater alot. It's simple, light and does what merino does, which is to say it adapts to whatever the ambient temperature so you're always comfortable, and doesn't smell. I run warm, so I'm always on the lookout for light weight sweaters. I bought this one because I was looking for something I could wear as a casual piece at work, with jeans, and also as a light layer while biking, skiing, hiking and travelling. I don't think this piece fits that crossover fashion/gear category. If I sweat in it, it tends to stretch and lose its shape, so it looks baggy and shoddy when I get to work. I guess what I'm looking for is something that slots in between 200 lightweight and 260 midweight, but equally capable of being worn at the office, or attempting to summit. something simple and clean. In summary, it's a really nice casual sweater, but not a technical piece of gear. 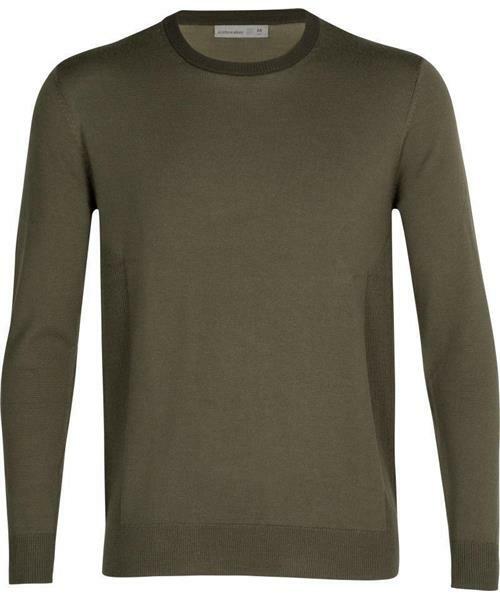 Rated 5 out of 5 by RoadLuca from Casual and Comfortable Great Sweater if you're looking for a light layer to keep you warm and add a little bit of style. Rated 5 out of 5 by JoSport from Touring and running Just perfect for my man! He loves it for sports and for casual!